The Newport-based firm represents businesses across multiple sectors as well as being at the heart of regeneration, development and business support communications work throughout Shropshire and wider Midlands region. In 2018 Be Bold won major contracts in the face of competition from national agencies, including the Marches Local Enterprise Partnership, Marches Growth Hub and Hereford Enterprise Zone, as well as expanding its geographic reach with new partnerships and collaborative PR projects. 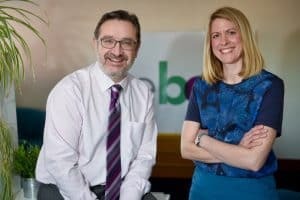 Most recently it made two more key appointments, bringing on board experienced senior daily news journalists Jon Simcock and Lorna McCann to add to the existing roster of PR & social media specialists on its staff based in Newport, Shrewsbury and London. Managing director, Mark Waugh, said: “We have continued our year-on-year growth by ensuring we have put together an incredibly capable and experienced team, which gives our clients the confidence that their interests are being protected and promoted on a daily basis. “We’ve secured millions of pounds worth of profile for clients who have been seen and heard everywhere from BBC National News to Newsweek and Huffington Post to Radio 5 Live. Be Bold director Amy Bould said the company’s investment in digital and video would continue to play a part in expansion plans, capitalising on multimedia projects delivered in 2018, including a short film at global property expo MIPIM in Cannes. She added: “It’s a process of constantly refining our offering, adding to our services and ensuring we continue to give our clients, whatever their size, what they need in an ever-changing media landscape. Our PR work is often at the heart of major national and international news stories, getting clients seen in their key target media nationwide, without losing focus on the value of regional coverage for many. Also among Be Bold’s client roster are leading Midlands law firm FBC Manby Bowdler, digital manufacturing specialist Protolabs, global veterinary products company Dechra, Shropshire’s largest independent care provider, Coverage Care Services, top tier county construction specialists, Pave Aways and cutting edge architectural practice, Base.